Here we come with details about an amazing event which is now available at U.S. Nine Wes online. Check it out below. Buy 1 item and get 20% discount on your purchase. 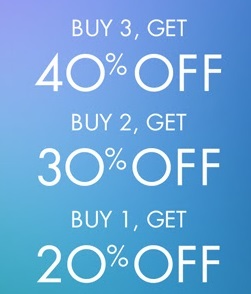 Buy 2 items and get 30% discount on your purchase. Buy 3 or more items and get 40% discount on your purchase. Source of the information is Nine West. Offer is valid until July 17, 2017. More details available at U.S. Nine West online.